a 24 hour soak in buttermilk. Let the dredging begin. Chicken fingers. Once you've dredged each piece twice, you are done and technically you can eat it. Apparently rosemary has a great internal clock, so as the recipe states, there is no need for a thermometer - when the rosemary hisses, remove and the oil is ready for the chicken. At this point our house started smelling like KFC. What did we learn from this Bon Appetempt? Fried Chicken is relatively easy, just very messy and if your attempting with no dishwasher and DIY tools, the process will require a couple rounds of dishes... The reward is well worth the work, though. The meal was tasty, relaxed, and super fun. Wow. 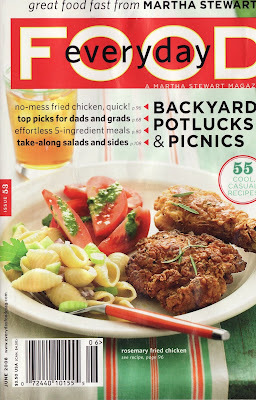 I was always too intimidated to make fried chicken at home... now I'm gonna give it a try!!! Yum! You know what I think you need? All-Clad jelly roll pans. They wouldn't let that grease drip into your oven. Send Mombers to the next sale! Another good thing about YOUR version is that the different foods don't touch each other. "Bon Appetempt goes All American and OCD!!!" Do you know what else is funny? 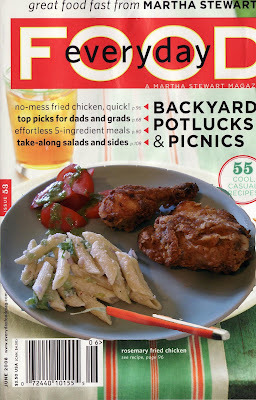 Martha's cover says "no-mess fried chicken!" Whatever, MARTHA. Bon Appetempt told me it's "very messy." I think you need some sort of label for recipes wherein Martha blatantly lies. That fried chicken look sooooooo good though! I want to go to there. Maybe she means "FOOD everyday"? Slightly different meaning, yes? In the words of fast food chain, Checkers, "You Gotta eat!" You could try sticking another pan on the rack below your chicken or some tin foil. I do that for pies.